Through her well-known Katitzi-series, Katharina Taikon raised public awareness of the growing exclusion and stigmatization of Roma people in Sweden during the 1960s. By presenting how the cult around Katitzi emerged and spread across Europe, the new exhibition Gallery8 has allowed for the emergence of burning questions which are of great relevance for today’s Hungarian society. The small exhibition room situated in the heart of the 8th district is full of visitors. It is Wednesday, around 2 o’clock in the afternoon. Outside the gallery, Roma children are playing football in the square market. A girl is drawing on the ground with chalk. Her sketch is about a hip-hop girl who is wearing trousers and listening to music. A self-portrait maybe… Parallel to this, in the gallery, a poster of Katitzi- the protagonist of one of the most beloved Swedish children’s book is hanging on the whitewashed walls. She has got long black hair and is wearing a long colorful skirt, it’s as if she was listening carefully to the discussion. Among the guests invited at the table I encountered László Arató, a passionate and progressive literature teacher who educates his pupils to reflect instead of just reproduce literature. Lawen Mohtadi, a freelance journalist and LGBT rights activist and the author of the first Katharina-Taikon biography, as well as Angelica Ström, Katharina’s daughter who teaches children with special needs in a state school in Stockholm. After sharing common reading experiences and interpretations of the Katitzi’s stories, they shortly changed the topic and started to talk about Katharina Taikon’s mesmerizing life story. Without this, it would have been hard to understand how the series became a cultural phenomenon. Would we have thought this of Sweden? Katharina Taikon was deeply engaged both as an actress, an activist and as an author. She was well-known within both Roma and Swedish culture, which meant she was twice as much exposed to the deeply-rooted prejudices of the post-war Swedish welfare society. However, this experience gave her the strength to become the first activist, critique and leader of the anti-prejudice movement. Katharina was like most Roma of the time, she was not allowed to go to school as a child, and it was only at the age of twenty-six when she finally learned how to read and write. She had a traumatic childhood: her father earned a living as a jewelry-maker and at that time Roma people were forced to leave their homes and move to other places, every three months. This was a vicious circle for them and because of this practice they were deprived from all welfare benefits, as they were not allowed to settle down and therefore were also excluded from the educational system. Katharina lost her mother at a very young age. As a result, she was at first sent to a foster family who ran a circus and after that she had to move to a care home, until her father married another women and could finally bring her back home. Her relationship with her step mother became difficult and at the age of fourteen she was compelled to a marriage. After one year, she was given the opportunity to be the protagonist of a Swedish short movie which was a breakthrough in her life. Following this film, she was on the screen for around ten years and became very well-known. Parallel to this, she also became more and more aware and engaged with the deprived situation of Roma communities in Sweden. Exactly half a century ago, in 1963 Katharina Taikon published her first novel, Gypsy Woman, in which by telling her own experiences she vividly depicted everyday discrimination Roma have to face. Her story was a shocking mirror of Swedish society. Therefore she also became more and more popular as a Roma human-rights activist. She was the first Roma woman in Sweden who occupied a public role. To my question: how did Katharina succeed in a white man’s world, Angelica, her daughter answered pretty simply: in spite of our prior assumptions, she could manage it quite easily. She explained that her mother always paid attention to acting upon her public role both within the minority and the majority culture. „She treated both cultures with respect, she always tried to appear as a cultural ambassador between Roma and Swedish people. For instance, when she was invited to an official event, she wore traditional Romani costumes. However the following question arises. 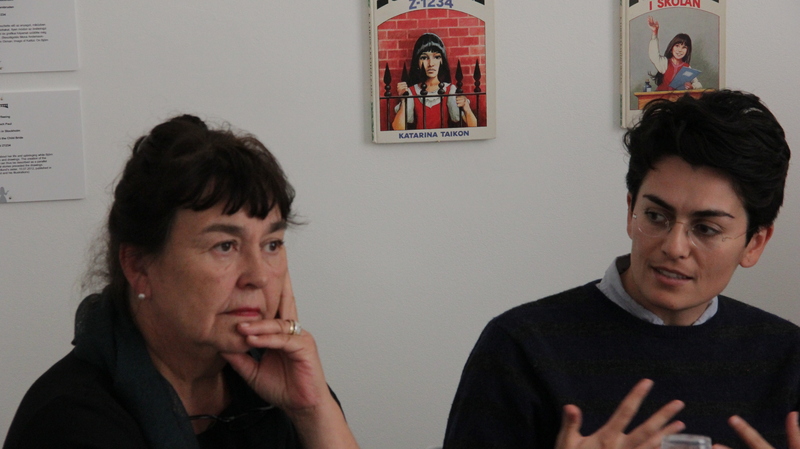 How did the Roma community welcome Katharina’s public activity within the Swedish culture? Lawen Mohtadi, the author of the first Katharina Taikon-biography ’The day I will be free’ published in 2012 reminded me that Katharina did not choose to be an activist instead of being a mother. She did the two together, therefore she did not come into conflict with traditional Romani values. „Having a public role as a Roma woman was totally unique in those days. Because of this, the younger generation was a bit suspicious about Angelica. It was the elderlies who recognized that Katharina’s work could change the life of all Roma people in Sweden. In general, we might think that the older generation tends to be more conservative when thinking on gender roles, but Katharina’s case interestingly showed that this could be reserved.” said Lawen Mohtadi. Katharina was not only a talented writer but also a good strategist: she soon found out how publicity works and she took advantage of this. She was travelling a lot across Sweden in order to give public talks against Roma stereotypes. However, in spite of all of her efforts she still could not bring about considerable changes against discrimination, during her journeys. Constantly meeting with usual negative stereotypes. She became completely fed up with educating adults on solidarity and mutual acceptance. So finally, she decided to turn to writing children’s books. This is how the first book of Katitzi was published in 1969. Within the next ten years, another twelve volumes followed. Katitzi gained such an enormous popularity among children and adults, that in 1979 it was adapted to a TV series. 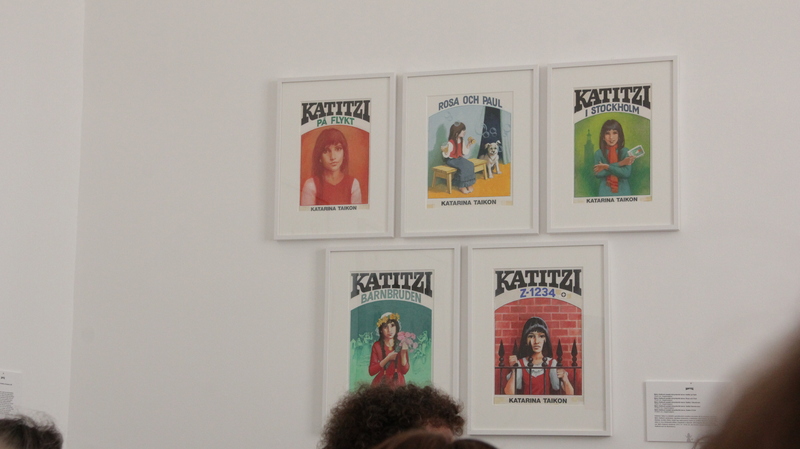 Meanwhile, Katharina visited schools to arrange readings of Katitzi and to promote the Roma human rights movement. The book series also received international attention. As a result, Katitzi has been translated into Norvegian, Danish, French, German, Hungarian, Czech and most recently into the Romani language. Katharina’s children’s books served as a source of inspiration for the Swedish society for decades. Regrettably, Katharina could not experience this all throughout, as in 1982 she fell into an irreversible coma which lasted for fourteen years. However, today Katitzi has lowered in popularity; the elder generation still considers it one of the best and most beloved books from their childhood. In the last few years, the revival of Katitzi sparked in Sweden: the story has been adapted first to a family-play in Göteborg, and then to a post-modern stage in Stockholm. The Katitzi-cult was also adopted in an exhibition at an art gallery in Tensta- Stockholm’s immigrant district. The gallery offered the same display which has now opened in Budapest at Gallery8 and will remain here until the beginning of December. At the Hungarian reception of the Katitzi-book, Vaspál Veronika- literary historian- revealed that a Hungarian translation was published for educational purposes in 2001 as a part of the government’s anti-discrimination program. In the framework of this program, 3000 copies were sent out to schools. Yet when Veronika started to investigate how successful the project was, she couldn’t find any of these copies in the schools she visited. Today the Katitzi-books are to be found mostly in libraries and in second-hand bookshops. What is more, thanks to the organizers’ engagement, Katitzi could be part of the pupils’ life again. 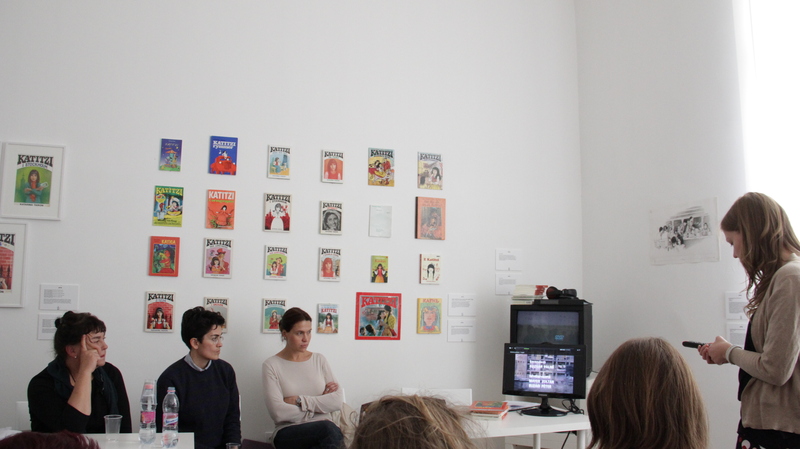 As part of the pedagogy program of Gallery8 readings and discussions will be organized again in local schools. The aim is the same: to keep the cultural tradition that Katharina Taikon has started in Sweden, which roots towards the inexhaustible potential of children’s literature and the power that it can have in the fight against exclusion and stigmatization. An issue that Hungary must deal with! ← Gyerekszemmel a kisebbségi létről – lehet-e hazai reneszánsza a svéd Katitzi-kultusznak? I loved these books as a child, but when I re-read them, they are sadly not that great. I would anyway love it if someone made a series of cartoon albums with this story. Also the Swedes life at the time seems very exotic to todays children, and I think the story just needs very very small adjustments to become a great story.